Metal Gear is a series born from limitations. Originally intended as a military shooter game for the MSX2 computer system, creator Hideo Kojima found the hardware unable to handle the large amount of on-screen action required for such an adventure. Instead of loud and overt blasting, the game’s direction switched to quiet and covert sneaking, laying the foundation for what would eventually become one of the most notable franchises in gaming. These unassuming beginnings are why, despite all the bombastic and ridiculous turns that the franchise has taken since going 3D, Metal Gear Solid on Game Boy Color works, and it does so far better than you might first imagine. Many a franchise pumped out a portable version on the Color — looking at you, Grand Theft Auto, Driver and Perfect Dark — but none really lived up to what made them fun in the first place. 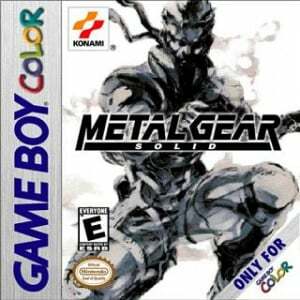 Metal Gear Solid preserves the top-down gameplay of its MSX forerunners while incorporating a few key mechanics from the PlayStation game, creating not only a great Metal Gear but one of the finest Game Boy Color titles ever produced. 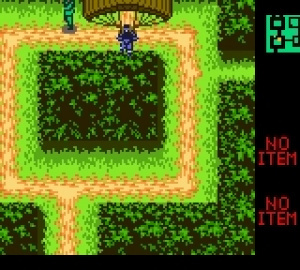 Released as Metal Gear: Ghost Babel in Japan, Solid Snake’s first handheld mission doesn’t really fit the series’ overarching continuity; it instead acts as an alternate sequel to the very first game. Taking place seven years after the destruction of the original Metal Gear mobile nuclear launch platform at military fortress Outer Heaven, Snake is recruited from his retirement in Alaska after learning that a new, U.S. Government-developed Metal Gear was stolen after the plane carrying it crashed over South America. It falls into the hands of the Gindra Liberation Force, a separatist guerrilla faction in the African nation of Gindra, who intend to use it to win their ongoing civil war. But things can’t ever be that straightforward for Solid Snake, as it turns out that the military base in which the weapon is kept used to go by another name: Outer Heaven. Snake's mission is simple enough: infiltrate the base and destroy Metal Gear. Featuring familiar faces from the PlayStation title, the plot befits the franchise's military action tone without delving into the ludicrous and convoluted depths in which the later fiction indulged. Stealthing around the former Outer Heaven is just as exciting on the smaller screen as it is sneaking through Shadow Moses, with plenty of the signature tense stealth moments and quasi-supernatural boss fights that put the franchise on the map. Not many games can tap into pressure like the Metal Gear series does, and nothing is lost in the switch to the smallest of screens — being spotted by a guard sends you into the same "oh snap" mode that never seems to lose its feeling of alarm and propels you to get to a safe spot as quickly as possible. Manoeuvring your way through a room, section or stage undetected brings immense satisfaction that goes unmatched on the system. 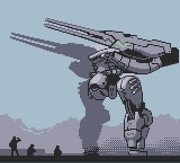 Metal Gear Solid works so well as a Game Boy Color game because its top-down, 2D nature isn't a regression or adaptation of gameplay but instead a return to form — in fact, by the time of its release in 2000, there had been three prior Metal Gear games, only one of which was polygonal. It builds on an already strong stealth foundation and cherry picks elements of the PlayStation classic that make sense for the design, like leaning against walls to evade passing enemies and shimmy under security cameras, hiding in tall grass, tapping the wall to get a guard's attention or even tweaks as fundamental as how equipment is selected. Those attuned to the 3D games may actually find the overhead view easier to deal with since there's much less risk of turning a corner only to be spotted by a guard you had no clue was there. The game isn't all just reworkings and updates, though, nor is it light on content. To best fit handheld gaming, Metal Gear Solid breaks up its campaign into 13 stages and doles out rankings at the end of each. Completing the campaign opens up Special mode that adds additional objectives to each stage to encourage replay value, and the 180 VR Missions provide even bitier-sized tactical espionage action. The series' first multiplayer component is present here as well with a two-player Vs. Battle mode using a Link Cable, provided you can find someone else with a copy of the game nowadays to try it out. Nor is it a game entirely without issue. The radar is without doubt helpful in navigating the world and getting a heads-up on enemy patterns but it is seriously diminutive; enemies show as no larger than a single pixel, which calls for some real eagle eyes. The controls are also functional but somewhat cramped — manageable, yes, but noticeably compressed. These are necessary evils, though, and getting around their admittedly minor inconveniences shouldn't take longer than a few stages. The perspective may have shifted back to its 1987 roots but Metal Gear Solid on Game Boy Color is very much a game of the new millennium. It's quite incredible just how faithful this portable title is to both the 2D games of the MSX/NES and the later polygonal PlayStation entries in terms of gameplay, tone and aesthetic. Lengthy, challenging and rewarding, Metal Gear Solid is far and away one of the best carts you can buy for your Game Boy Color, and a title we can only hope hits the 3DS Virtual Console sooner rather than later. I loved this game back in the day! hopefully it will make it's way to VC in the near future! Great game, still love it. Damn, I wish that this one will make it to the VC. I used to have a retail copy of this, but then I was stupid and sold it with my GBC. Always wanted to play this game, but never managed to. Here's hoping a 3DS Virtual Console release is in the works. Would've been great if they had released this on VC in time for MGS3D. This is more fun than the lame MGS3D demo. Amazing! @bezerker99: A full MG gaiden game is more fun than a 10 minute demo of a bad remake? No wai! I have a GBC for some reason... Anyone know of somewhere to buy this cheaply? Otherwise I'll just wait for 3DS VC. Brillant game, so much content, and it pushed the GBC super hard! Call me old-fashioned but this is straight up my alley! Bring it to the UK and I'll be all over it. Graphics look quite bad - even for a GBC game. Havent played it though - I should try it out. Never really played this one but that was cause at the time I was more into the Playstation and wasn't that big into portable gameing. Thinking this was a waterdown version of the PS version I passed on it looks like I may have made a mistake. If this comes to the 3DS VC I might pick it up if the price is right. ...and yes I muted the video because that guy's voice is horrible. This is my favourite GBC game! It basically fits in the series continuity but you have to beat 100% all the extra missions to see this. I want more Metal Gear games like this. I'm so tired of the 3D ones. I want this so bad. Once this hits the VC I don't care if we get anything else. I've wanted to play this one for years, but I don't recall ever seeing even a used copy anywhere. Hopefully Konami will be kind enough to put it on the VC someday. Because I would gladly give them my money. I remember buying this game for $10 new at Wal-Mart and I really enjoyed it, but eventually sold it with some other GBC titles to buy a GBA. I sold it to Baysoftgames.com (Don't buy ANYTHING there anymore; Pre-2006, they were pretty awesome) 3-4 years ago, I bought a used copy at GameStop, and the the exact same VR missions were completed that I completete and Snake was at the same point in the game I was before I sold my copy. I think I actually bought the EXACT same copy of the game I sold to some company out of my state. :3 ooh, I would definitely buy this on VC. Great review Jon. I never got the chance to play this game. I enjoyed the original Metal Gear and Snake's Revenge on the NES when I was a kid. I really hope that this one comes to the eShop, I am sure that I would enjoy it tremendously. After playing the MGS3D demo (which I loved, even without the CPP) I really want to get into the series. I'll be picking up MGS3D soon (either that, or RE:R, which I still haven't played), and after reading this review, I hope this is released on the eShop, because it would be a guaranteed download for me. I actually enjoyed playing this version more than the 3D games. It didn't feel bloated with hours of non-interactive cut-scenes and everything was simpler and more intuitive imo, from the controls to the game view, and it was just a lot of fun. @Savino The same people "hate" books. Catatonic fools with no imagination. This is why Nintendo needs to speed up the Virtual Console releases. So games aren't lost to time. I think I would like the top-down view. I always get killed because I can't see around corners in MGS. Scratch that ... I just always get killed. But this might be less bad and more good! GET UR ****ING @$$ ON THE VC!!!! @DrHamHock Wow. If your argument for a game with lesser graphics is that I use my imagination then clearly you dont understand the basics of the market. Graphics are certainly not everything in a game, but being able to criticise them doesnt mean you're a book hating fool with no imagination. Take a chill pill bro. NO! THE PRICE IS WRONG BOB!!!!! meanwhile, on the other side of his mind. OMG! there's a gbc version of mgs SUV! Oh, how I loved this game. I played it several times, even while I had games with superior graphics in my PC and non-handheld consoles. 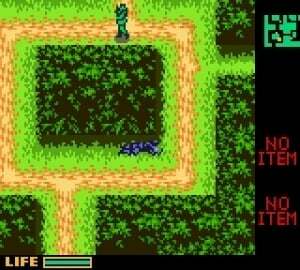 This is actually the first Metal Gear title I ever played. It's the game that got me into the franchise. Should it come to the VC (please, please let it happen), I'd buy it on day one. just found metal gear solid 2 for the original xbox lol coincidence? I have not played this game before, but it looks really violent! and I'm not sure if I want this game, 9/10 makes me want this for my gameboy color, but this looks crapy. NEED this in the 3DS eShop Virtual console NOW. Anyone filling ouy those nintendo surveys for buying games MUST mention this in their comments! Such a great rendition of the MG series! Anyone remember the Grinch variation of this game on GBC? Surprisingly great.